Last January I watched Slaughter High, which was a film that managed to force in these weird rules about April Fools’ Day. Rules that are almost entirely obsolesce, but managed to become the basis of the killer’s actions. It was shoehorned in and probably not necessary. Which is how I feel about “The Tale of the Whispering Walls”. It’s Betty Ann’s turn to tell the story. When the Midnight Society arrive at the fire, they find her donned in a hooded cape and a skull mask. She tells them the mask is the only protection against the spirit that go hunting during a full moon on Leap Year. Don’t worry, the mask is completely inconsequential throughout the episode. Betty Ann’s tale follows a brother and sister and their babysitter as they drive home from a day at an amusement part. The babysitter, Louise, becomes lost. The signs for Highway 9 are all different to what she remembers. Mostly that’s because someone’s nailed up clearly fake signs pointing her in the opposite directions. He then gives them directions, saying that a shortcut along a dirt road will cut miles off their journey. Louise gets the kids back in the car and follows the man’s directions. Only the car breaks down in front of a large Victorian mansion along the way. Louise tells Claire and Andrew to wait in the car while she goes in the house along to ask to borrow the phone. When she reaches the door and knocks, it opens by itself. The children sit in the car completely bored. Eventually, they realise that Louise isn’t coming back. They gather their courage to follow her into the house. Again, when they knock the door opens by itself. This should set off all the red sirens, but I guess not. While searching for their babysitter, Claire and Andrew walk down a hallway filled with empty frames on the walls. They eventually come across a room that looks as though it has been set up for a party. Both of the little idiots believe that their babysitter set it up for them. But when Andrew accidentally drops his banana split on the floor, it begins to dissolve into smoke and turns into a face of a laughing man. Claire and Andrew run from the house and agree to go back to the tavern. But when they arrive back at the Whisper Inn, they see that it is no longer empty. Inside, it’s filled with people dressed in clothing from a distinctly different era. None of the people inside are particularly helpful. They tell the children that their babysitter will be fine. It’s the full moon on leap year! (Again, whatever that means). But they do share that the man who owns the house is Master Raymond, and that he will take care of Louise. One of the women, dressed in Victorian garb, merely says that Claire reminds her so much of her daughter. The kids decide to leave, forgetting to ask about the phone. They turn back to the tavern again, only to find that it is empty once more. The children return to the house to search for Louise, who they find trapped in the mirror. But when they begin speaking to her, Louise turns into Master Raymond. Claire and Andrew rush up the stairs and into the hall with the frames. Only this time, the frames are filled with the moving pictures of the guests from the tavern. They think they find Louise again, this time holding onto a baby in a nursery, but yet again they realise it is actually Master Raymond. When they run away again, the two become separated. Claire finds a sculpture flagged with two sconces. The face in the sculpture speaks to Claire, saying that it is actually Louise. The girl clutches on one of the sconces, which activates a revolving wall. Andrew, meanwhile, rushes to the front door, and realises that he can’t get it open. He remembers then being told off by Master Raymond for not closing the door. The door blows open, and he finally connects that the wind outside has something to do with Raymond’s powers. With the door still open, Andrew rushes upstairs to find Louise and Claire. He is able to activate the revolving door and finds the two girls in the room with Master Raymond. Master Raymond tells the children that once the sun sets, Louise’s soul will be his forever. During his speech, Andrew spots a vase. He quickly picks it up and hurls it at a blacked-out window, shattering the glass. The wind gets rid of Raymond, and wakes up Louise from her trance. The three kids run down the stairs, but before they can read the door, it slams shut on them. They come face-to-face with Raymond yet again, but this time they’re saved by the Victorian lady. She again mentions how much Claire is like her little girl, and wants to spare her. She opens the door, allowing the wind to rush in. Raymond vanishes in to a white mist, allowing the three kids to run free to the car. As the children drive away, another car pulls up right after them. A man comes out looking lost. Betty Ann then tells the Midnight Society that the house still stands and people still disappear there. 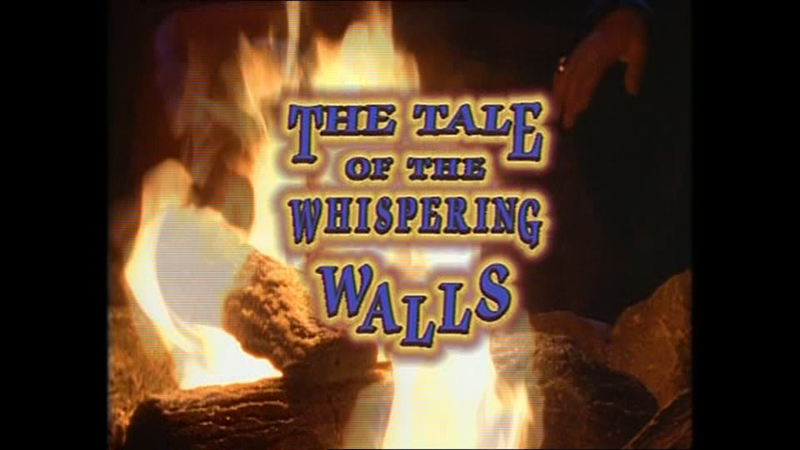 “The Tale of the Whispering Walls” is pretty fun. Betty Ann’s tales are usually some of the best, and this one is no exception. One that could use with some fleshing out, but manages to get a good story down in 25 minutes. We learn nothing about Master Raymond other than that he’s evil. How can he use magic? Why does he want souls? But most of all: what was the point of that stupid mask, Betty Ann? You could have at least included it in your story, lady.